Skanska has sold the office building Green2Day in Wroclaw, Poland to the real estate fund manager Niam for EUR 51 M, about SEK 510 M. The transaction will be recorded by Skanska Commercial Development Europe in the first quarter of 2018, with the transfer of the property scheduled for the third quarter of 2018. 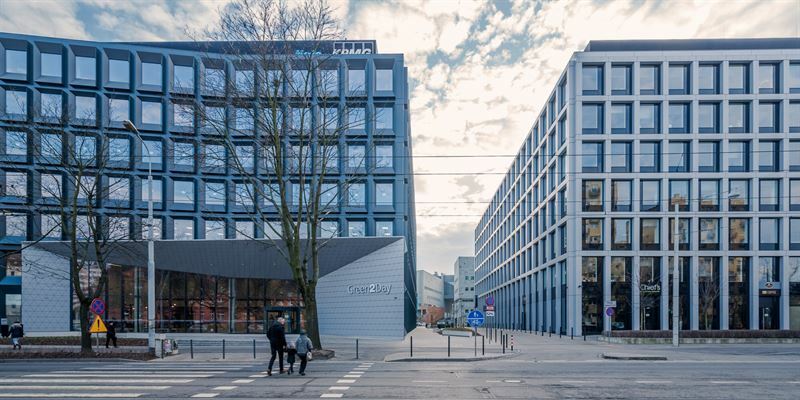 Green2Day in Wroclaw was completed in fourth quarter of 2017 and offers approximately 18,000 square meters of GLA. It is leased to known companies such as ULTIMO, Tieto, Business Link and KPMG. The building enjoys excellent access and visibility thanks to nearby one of Wroclaw’s main communication hubs – Reagan Roundabout. The community spaces in front of entrances transition into a new pedestrian footpath along the Odra River and create new places in the center of Wroclaw. The Green2Day project is expected to receive LEED Gold certification (Leadership in Energy & Environmental Design). It will also be certified as a “Building without barriers” for its accessible design and inclusiveness for people with disabilities.